Forward head posture can affect various areas of the human body such as the spine, shoulders, and neck. Not only is poor posture bad for your musculoskeletal system, it can also cause key muscles that are responsible for maintaining stability to atrophy. Whether you suffer from forward head posture due to unavoidable circumstances such as motor vehicle-related injury or whiplash, or you have unknowingly developed forward head posture from overexposure to electronic devices, there are a number of additional symptoms that individuals with forward head posture experience that can worsen your overall state of wellbeing. Side effects such as headaches, muscle soreness, body aches, and temporomandibular joint syndrome are all prevalent symptoms of forward head posture. This is why it is important to maintain optimal posture whenever possible. Throughout this article, we will discuss how neck pain can turn into a chronic issue, while also providing easy techniques you can use at home to aid in the strengthening of your neck muscles. If you suffer from neck pain and are seeking high-quality chiropractic care, talk with one of our knowledgeable staff members at ChiroNow Loveland today. 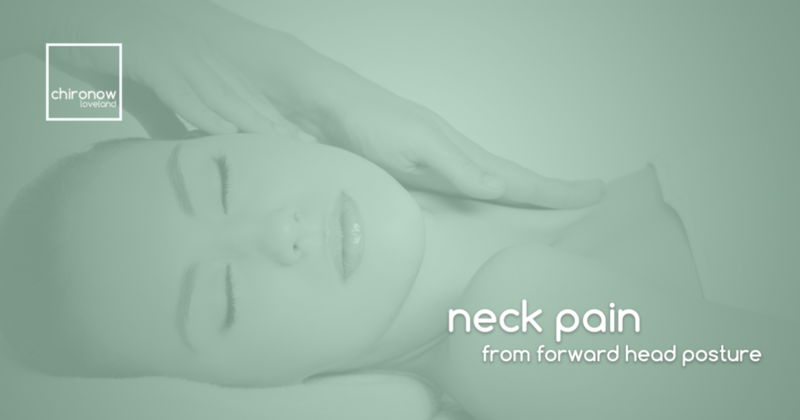 We’ve helped a number of individuals with their neck pain in Loveland, and our chiropractor can help you find relief from the most severe neck pains. We are always available for walk-in appointments. To learn how to mitigate the stress, tension, and pain that comes from forward head posture, continue reading more below. Whether you experience stress at work, have suffered a prior injury, or do not maintain proper posture, neck pain can be detrimental to your daily activities and overall quality of life. As tension develops throughout the neck, your neck muscles will begin to tighten which can limit your mobility. This causes your head to droop forward, as the muscles can no longer support themselves, and it can be rather painful over extended periods of time. According to Dr. Kapandji’s book, The Physiology of the Joints Vol. 3, “For every inch of Forward Head Posture, it can increase the weight of the head on the spine by an additional 10 pounds.” While many think that forward head posture only affects the neck, the truth is that forward head posture can also have adverse effects on the shoulders, spine, and back. If not correctly treated, the suboccipital muscles in your neck can also become tight, causing headaches, and in severe cases, vertigo. This is why it is important to be mindful of your posture throughout the day so that maintaining good posture eventually becomes second nature. Though you may currently be experiencing adverse effects from forward head posture, the good news is that there are several techniques you can practice at home to train and strengthen the neck muscles. You can easily check if you are experiencing forward head posture by standing up straight against a wall. If the back of your head does not touch the wall without effort, you should consider strengthening your neck and correcting your posture. To begin loosening your neck, start by placing a tennis ball underneath your suboccipital muscles located just below the base of the skull. You may feel a slight discomfort, which is an indication that you are massaging the right spot. Practicing this technique daily will help ease neck tension while improving neck mobility. You can also strengthen your neck muscles by doing lying chin tucks. Simply lie on your back, and gently lift your head off of the ground while tucking your chin towards your chest. This will help build strength in the back of your neck, as well as the front of your neck, which will help you maintain good posture without effort. Throughout the day, there may be times when you notice yourself slouching or not standing completely upright. Over time, your posture can become progressively worse, if not properly maintained. To correct bad standing posture, tuck your stomach, pull your shoulders back and let the shoulders drop naturally. Your head should not be in front of or behind the midline of your body, as you can then begin to quickly develop poor posture yet again. Following these steps will help alleviate neck, shoulder and spine pain, and over time, will help correct those suffering from forward head posture. If you experience daily neck pain, tightness and limited mobility, visit ChiroNow Loveland today. We help mitigate a wide variety of aches and pains such as sciatic pain, low back pain, spinal misalignments and so much more. Not only do we offer affordable adjustments for all of our patients, we also provide consultations so that we can apply the proper methods of treatment on a case-by-case basis. To learn more about our services offered, or to schedule your consultation today, visit our website or call our office in Loveland!